I can't help but think of fear when I'm painting a portrait of a man who said "The only thing we have to fear is fear itself." 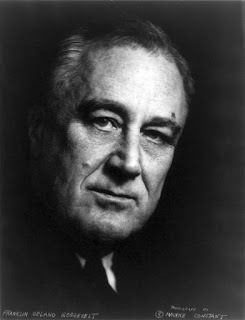 Franklin Delano Roosevelt said the words in his first Inaugural Address in 1933. Here is the full quote: So, first of all, let me assert my firm belief that the only thing we have to fear is fear itself—nameless, unreasoning, unjustified terror which paralyzes needed efforts to convert retreat into advance. What great words to describe fear: nameless, unreasoning, unjustified terror. We FEAR THE WORST. News hits us, about a health prognosis, an accident, or a tragedy in the news. We instantly and instinctively go to that dark place of gloom, imagining the worst possible outcome. Then we retreat, recompose our thoughts, and bargain with the cluster of facts we have to design hope. We FEAR THE UNKNOWN. That which we don't know terrifies us. "The undiscovered country from whose bourn no traveler returns," wrote Shakespeare. Death. Dying. Scandal. Loss. FEAR PARALYZES. I remember being so scared as a young person that I couldn't move. I've been so scared as a grown man that I couldn't think. Fear has this debilitating effect that can stifle all hopes of moving forward. How many times in our lives does unjustified terror settle in and take residence? All too often I'm afraid. Roosevelt became President of the United States during the dark early days of the Great Depression. People were suffering by the millions; hope was fleeting, fear was flourishing. In just a few short words he penetrated the very essence of fear and posited a way to work through it: by better understanding it, embracing it.